Located immediately across from Stan Hywett Hall, you cannot ask for a better setting for this home. Featuring great bones, great room sizes and many mid-century modern details, this home is ready for your vision and creativity to achieve a one-of-a-kind home in a prestigious area. Spacious, livable floor plan, featuring a large living room with full corner of windows and a unique stone fireplace, large eat-in kitchen off the dining room and the family room, and a lovely mature back yard. Family room has stone fireplace and built-ins, and could easily be opened to kitchen to create an open living area. First floor den at rear of home with door to back yard. Screened porch (other room) off formal dining room and fantastic concealable bar that is 100% mid century fun! 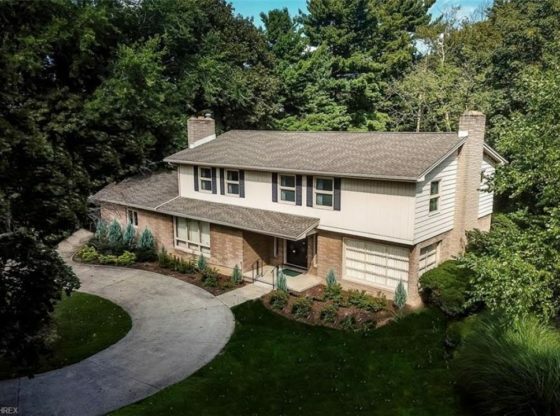 This stone and aluminum home features 4, possible 5 bedrooms, 4 baths, a finished basement and a large foyer with curving staircase featuring unique wrought iron railing. Large master bedroom has in-suite bath and multiple closets. Make this home your own showplace! New roof 2009 and boiler 1999. Central air. For more information about this property, please contact Nikki Relic at 330-697-4904 or [email protected] You can also text 5240796 to 67299.